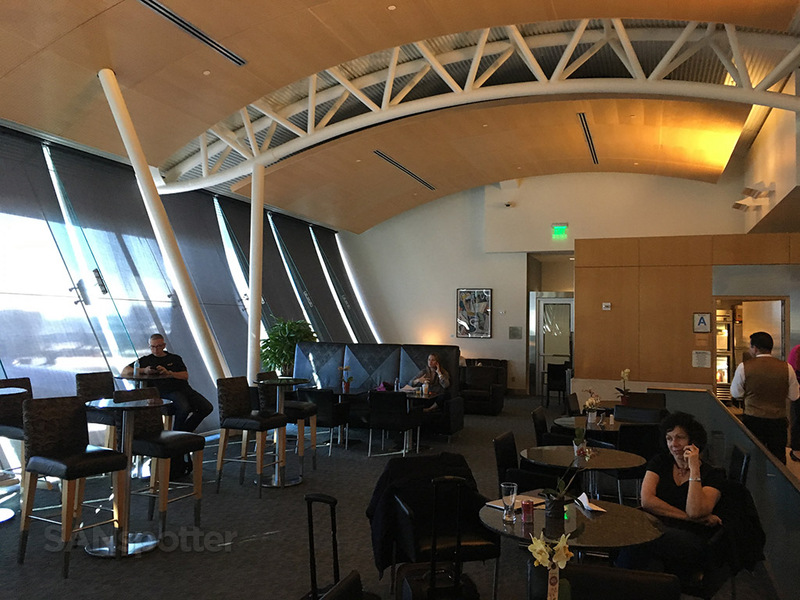 Despite the minor delays on the flight up from San Diego this morning, I still had a little over two and a half hours to check out the American Airlines Flagship Lounge located in terminal 4. 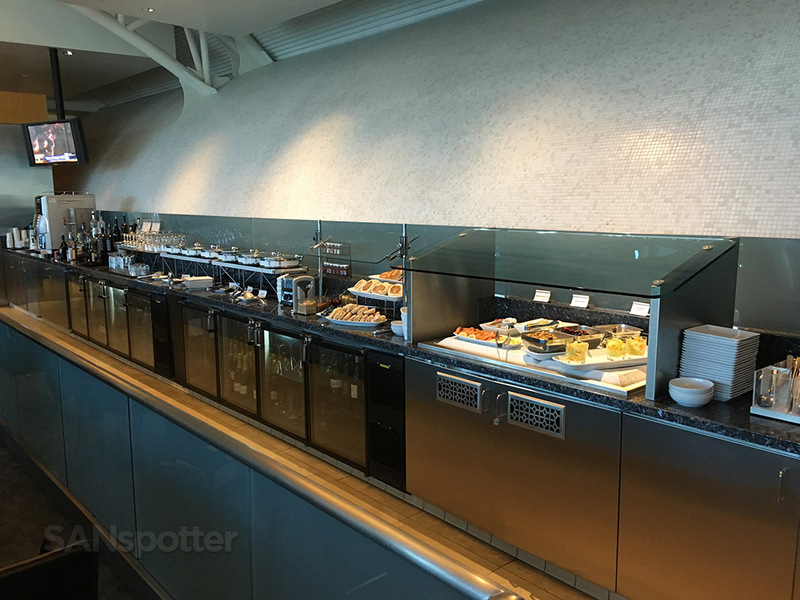 And just like my experience trying to find the Hawaiian Airlines Premier Club in Honolulu last month, I had a heck of a time finding this Flagship Lounge here at LAX. 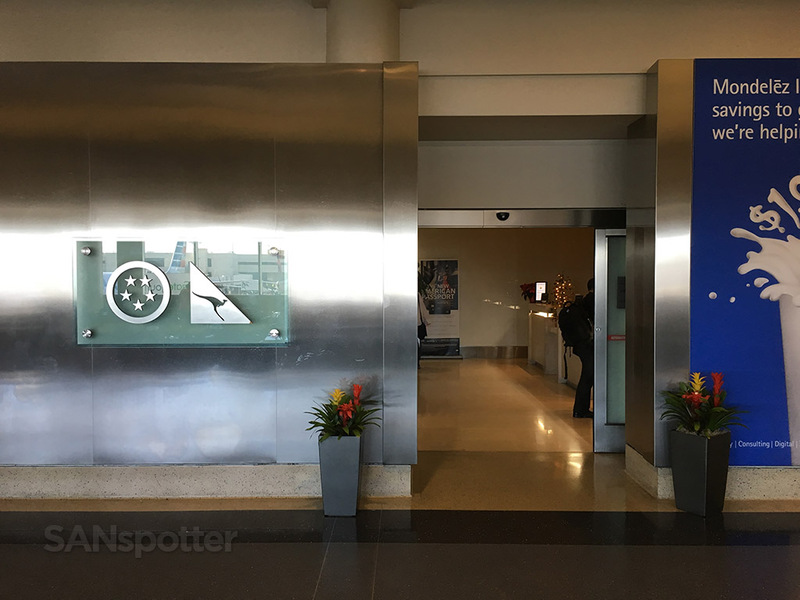 There wasn’t any signage for it or all, but long story short, it’s actually located inside of the regular AAdmirals Club. Good idea – but I wish they would communicate that better from the outside. 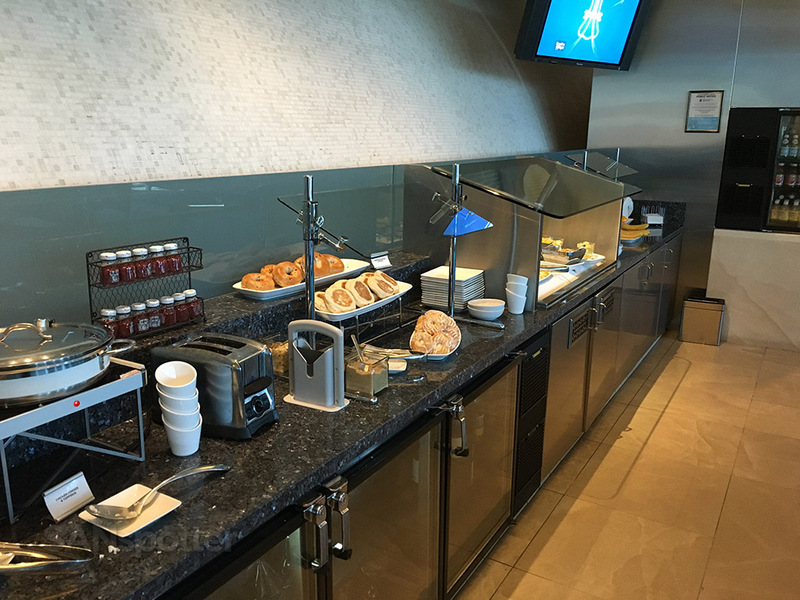 Upon checking in at the front desk of the AAdmirals Club, first class passengers (and those with access to the Flagship Lounge) are given a special card key to get inside. I ended up doing a full lap of the main lounge before I found the “secret” Flagship door. Again, the signage here was lacking. 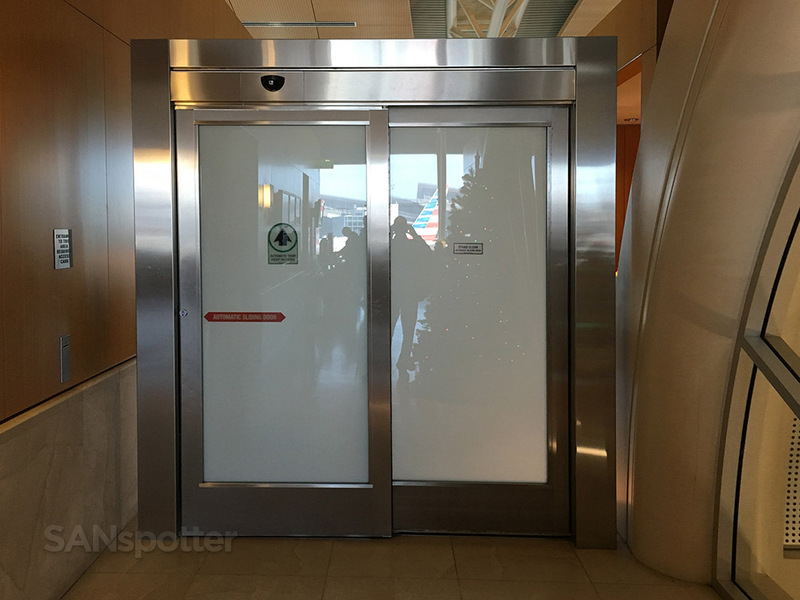 You would think that the marketing team would be proud of promoting an exclusive perk like that, but the entrance was just a frosted glass door with a card reader to the side. Once through the doors, I was greeted by two very nice desk agents who took my card and welcomed me inside. My first impression of the place: pretty nice! 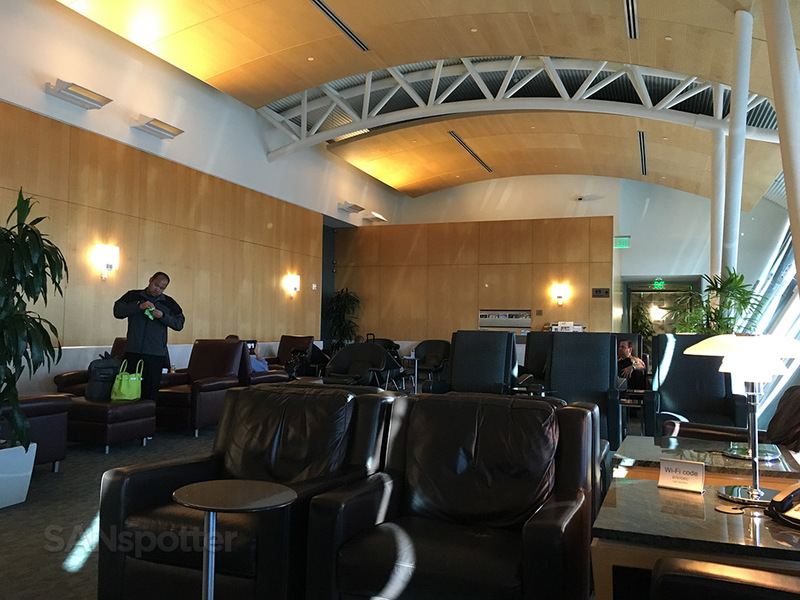 It was really quiet compared to the main terminal and the main AAdmirals Club, so that was a welcome relief. Also welcome to see was a full bar of cold and hot food items. 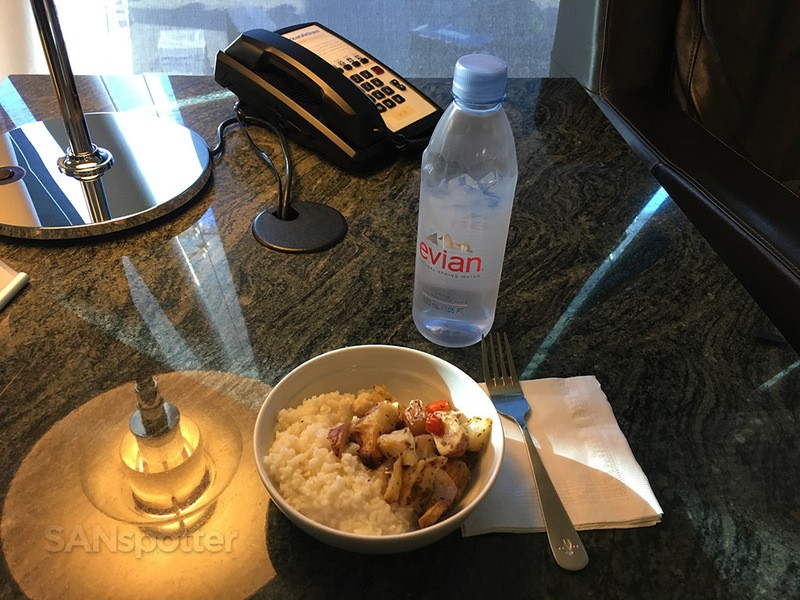 I tried not to eat too much, as I knew that I’d be eating well on the airplane several hours later. 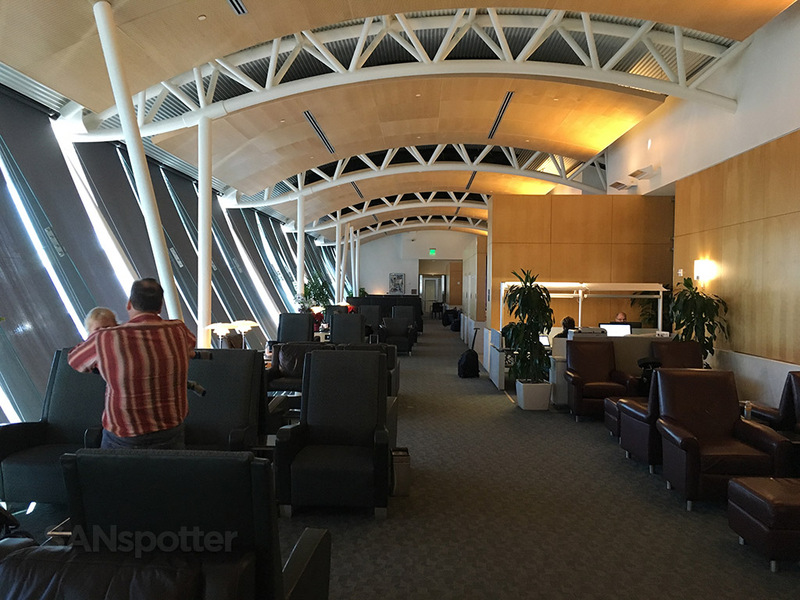 Here’s an overall shot of the entire lounge standing at the back wall looking towards the front. The bathrooms are behind me, and the food is all the way forward on the right. 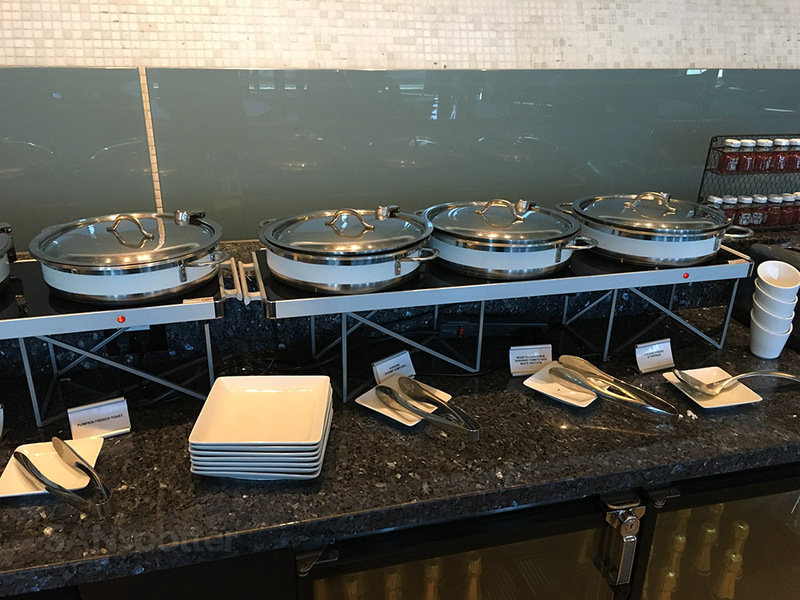 This is the view from the mid section, looking towards the food area. The check in desk is on the right. You won’t leave this lounge thirsty. 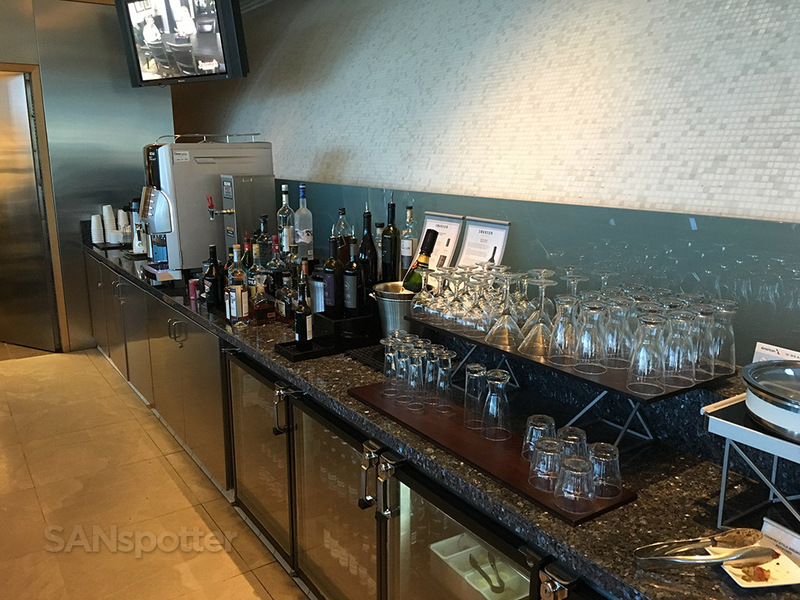 One of the best self-serve drink bars I’ve ever seen in an airline lounge! I found what I thought looked like a quiet place to sit and enjoy my breakfast, but it was right across from the business center (which isn’t sectioned off) and there was a guy there yapping on the phone – using the speakerphone no less – which got annoying fast. Luckily, it didn’t last for more than 10 or 15 minutes and he was finished and gone. There was also a man with a crying baby in the back corner which I thought was going to be a problem but things were quiet again in just a few minutes. 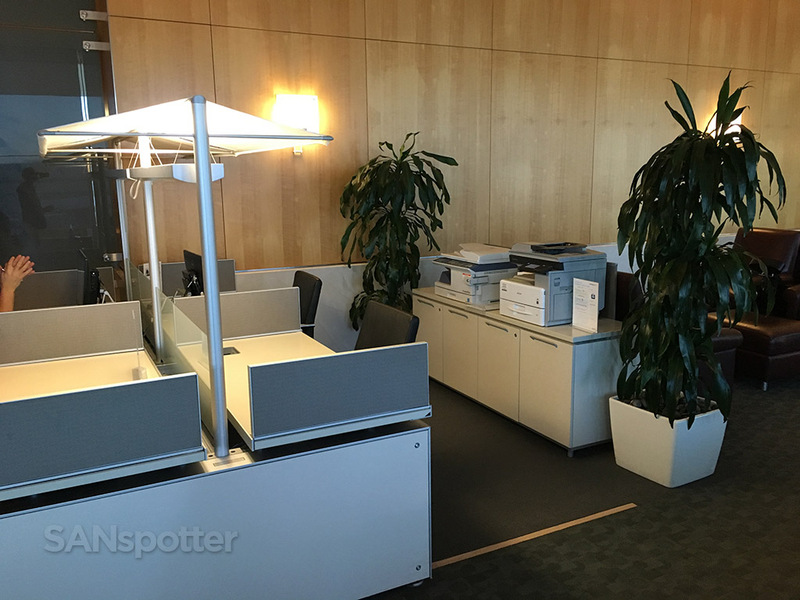 This is the business center, which was located adjacent to where I was seated. Those hands belong to “speakerphone guy”. If you’re curious, I tried to keep my breakfast as healthy as possible. 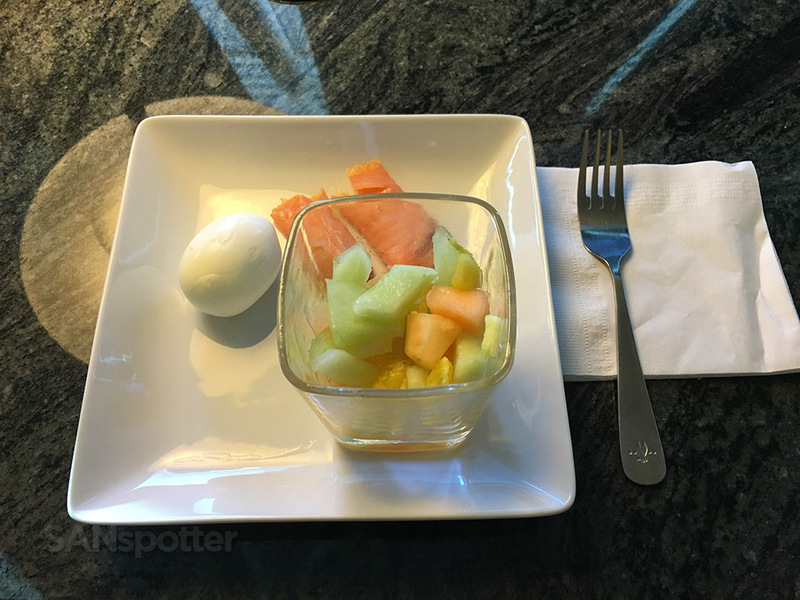 I started with a boiled egg, smoked salmon, and fruit. The second half of my breakfast consisted of some really tasty roasted potatoes and rice porridge. 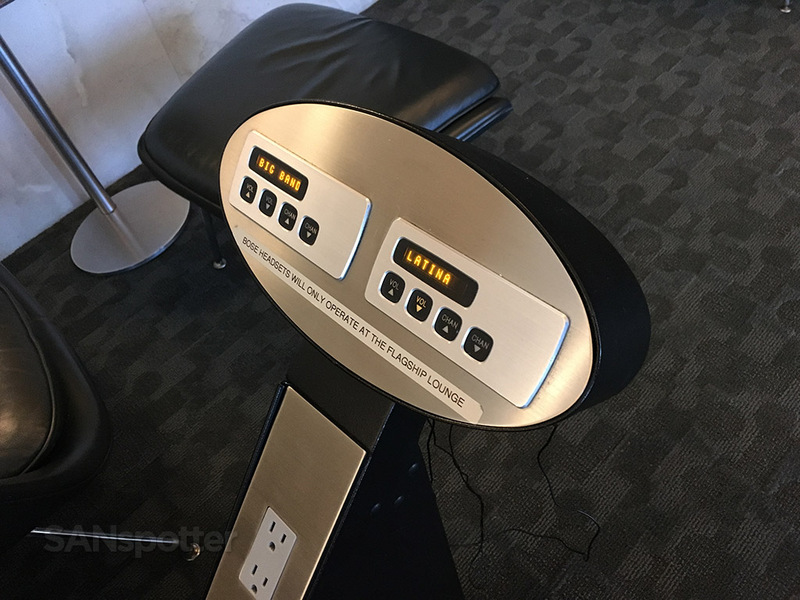 I didn’t notice it until I was leaving, but there is a section in the back of the lounge with noise-cancelling headsets for anyone wishing for more peace and quiet. Finally, the men’s room. 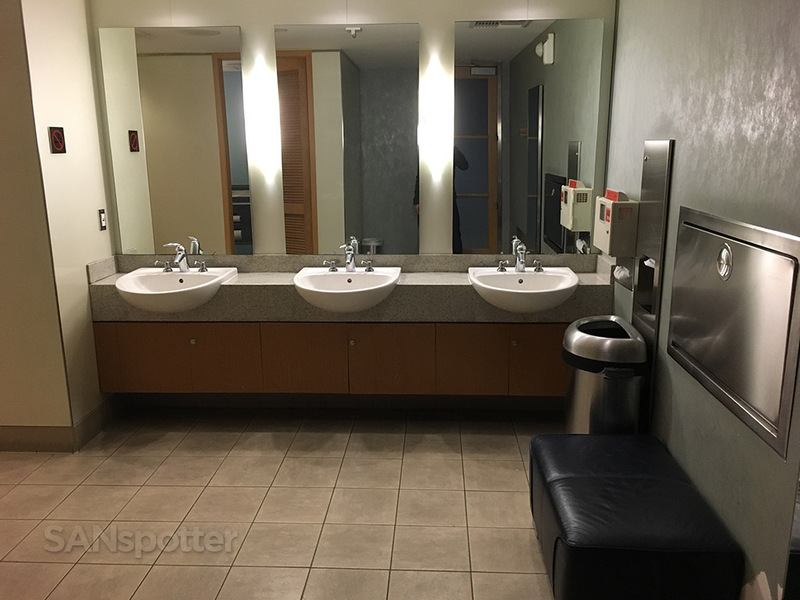 Because…well…it’s becoming a bit of a tradition to post bathroom pics here on sanspotter.com! 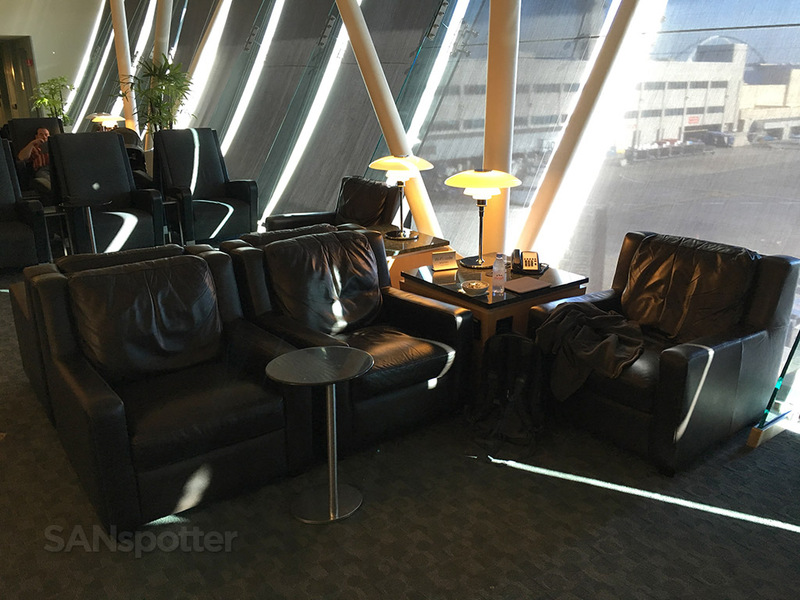 Overall I thought this was a really nice lounge – much nicer (and larger) than the Star Alliance First Class Lounge located over in the Tom Bradley International Terminal. 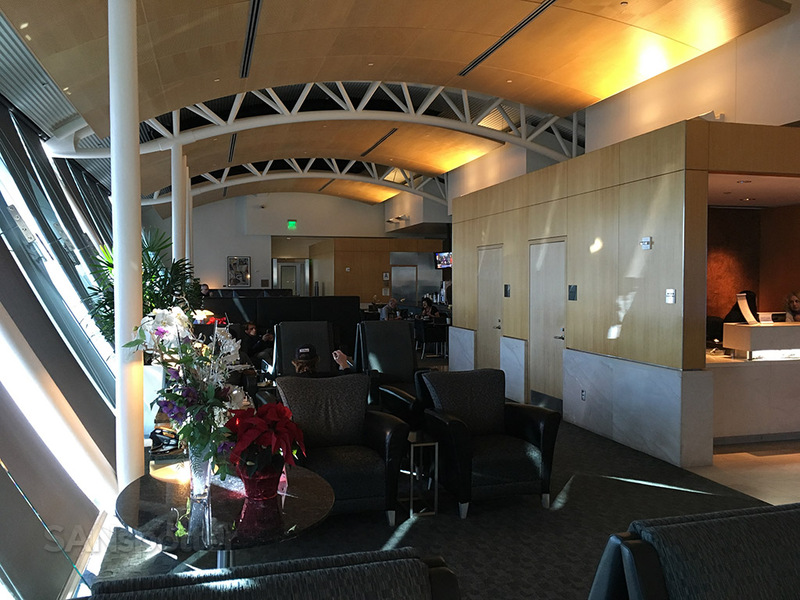 The best thing about the place (IMHO) is the fact that it is a very quiet and relaxed sanctuary from the chaos of the bustling crowds in the main terminal below. Terminal 4 at LAX is a complete zoo – so any decent escape from it is highly welcoming in my book.